This is one of the best books I have read in 2017. It is a thriller that keeps you guessing and on edge. 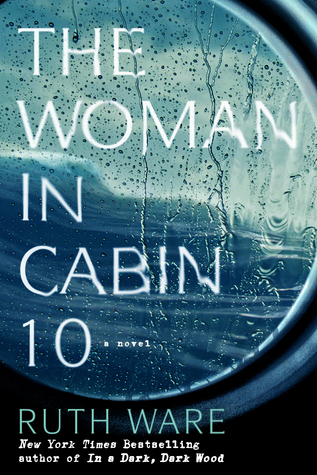 Ruth Ware’s Woman in Cabin 10 following the events on a luxury cruse from the point of view of Lo. While you start off neutral when it comes to Lo soon you come to see that she is an unreliable narrator. Lo is written in such a way that it is hard to tell what is real and what isn’t, I found her to be one of the better examples of an unreliable narrators because she is so relatable and seems so real. Another bonus for this book was that nothing was predictable, there were so many twists and turns and I did not predict most of them. I don’t know about you, but I have found a lot of mystery or thrillers to be very predictable and it can be such a bore. The Woman in Cabin 10 is not this. Another thing I enjoyed about this book was the atmosphere of the story. I loved that it took place on a secluded ship in the middle of international water. It added so much to the story because you knew that no one has left the ship and no one knew came into the ship. It also seemed to mirror Lo. Not only was she mainly on her own trying to solve this mystery, the ship was alone at sea sailing to the port across the Atlantic Ocean. While I absolutely loved this book I felt like the first 50 pages or so were not as expected and at times unneeded. I was actually thinking about putting it down because we weren’t on the ship just yet. So if you do decide to pick this book up, keep this in mind. Also, I felt that some of the relationship events that happened didn’t always add anything to the story, but was there just to create friction in the story. This book, even with its faults, is one of the better thrillers I have read. Not only is it one of the best thrillers, it is one of the best books I have read in 2017. Ruth Ware is an author I can easily see myself picking up more of her novels. In fact the day after I finished this book I went out and picked up The Lying Game. Her writing is lovely and easily flows. I found myself reading for hours without realizing the time passed. If you want to read a thriller pick up this book. If you want to read a book with an unreliable narrator pick up this book. If you want to read a book that will keep you on edge pick up this book. If you want to read a book that will throw you for a loop read this book! If you couldn’t tell already, I think everyone should pick up this book. Thank-you! I hope you end up enjoying it. I’m kinda glad I was not the only one who thought this. I was starting to think I was just being nit picky. I think the author did it purposely to add to the suspense and to make Lo seem crazy.